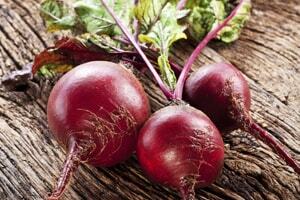 Beets get their bright purple color from betalains, which studies show can ward off degenerative diseases like cancer. These colorful roots can help bolster the immune system, provide fiber for digestive health and supply folic acid, which can prevent gray hair and strengthen neural tubes. Naturally sweet, beets can be eaten baked, boiled, steamed or raw.